‘He who has not seen Granada, has not seen anything’ says an old Spanish proverb. Another common saying in Spain puts it quite bluntly: ‘It is a great pity to be blind in Granada.’ Alhambra, which means ‘red castle’ in the Arabic, is a vast palace and castle complex of the Moorish monarchs of Granada.Covering nearly 105,000 square meters, it is beautifully situated on a rocky hill overseeing Granada. Alhambra comprises of Generalife Gardens and Palace (summer place of the Nasrid Emirs), The Carlos V Palace (Renaissance building constructed in 1527), The Nasrid Palaces, the centrepiece of the Alhambra (complex of palaces from the 13th century renowned for detailed ornamental plasterwork), The Alcazaba (9th century fortress) and a few smaller areas. 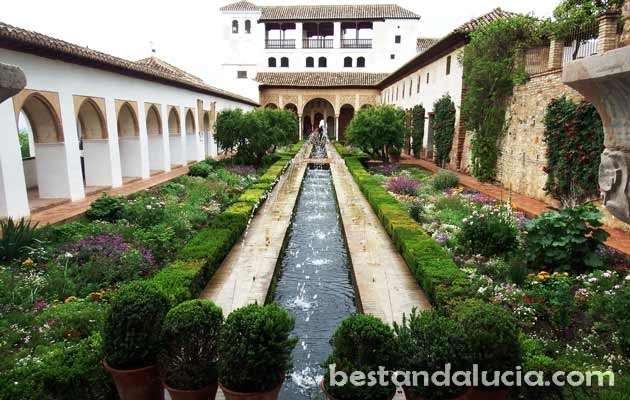 As the most busy tourist site in Spain, Alhambra requires that you buy tickets well in advance, usually at least a month before a planned visit is needed. Remember to take with you the debit or credit card that you have used to pay for the tickets. You will need it to collect the entrances when you arrive at the site. Before booking, bear in mind that the morning visit is recommended if you want to avoid the crowds. Getting to Alhambra is fairly easy as you don’t have to enter the city centre. From the Autopista A-44/E-902, Granada’s ring road, take exit ‘Alhambra/Sierra Nevada’. Follow the signs. When you see the road going into the tunnel, get into the left lane which goes to Alhambra (otherwise you will end up on the road to Sierra Nevada). Then, on the big roundabout take the second turn (the one which goes uphill). This road will lead you directly to Alhambra’s parking. 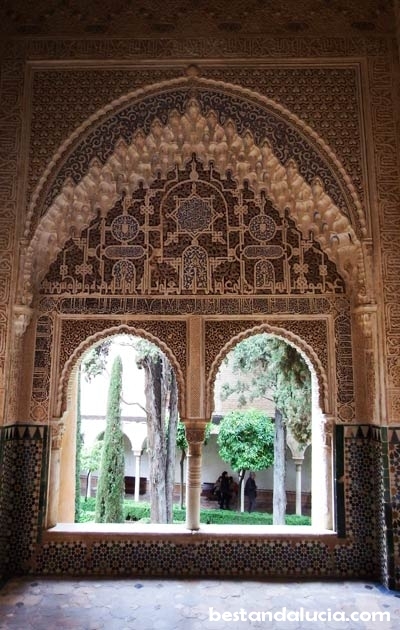 A visit to Alhambra takes at least 3 hours, but inside you won’t find any restaurants or bars, only several vending machines serving coffee, tea, snacks and sandwiches. Remember to take some proper food with you.